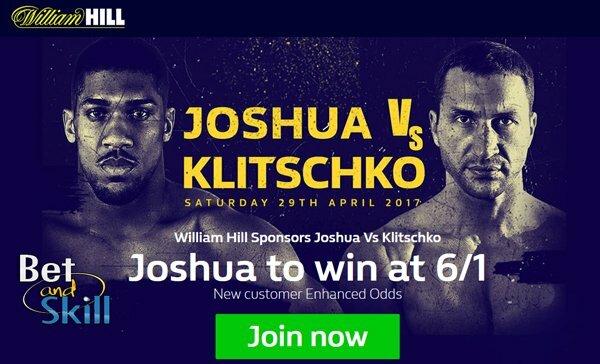 The most anticipated boxing event of the year is nearly upon us and to celebrate bookmakers are offering fantastic promotions on the Joshua v Klitschko fight! 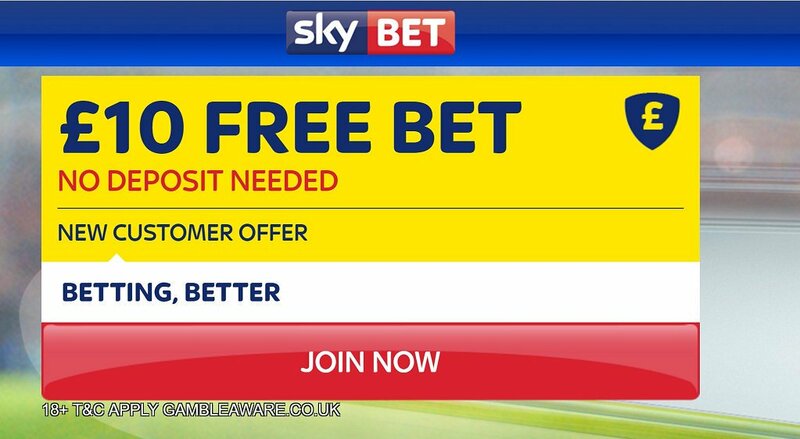 We are collecting the best bookmaker free bets, enhanced odds and betting promotions on the internet. We will update this page periodically, so bookmark it and come back soon! Anthony Joshua v Wladimir Klitschko takes place at 22:00 at Wembley Stadium on Saturday Aprl 29 and Ladbrokes are offering new customers the chance to bet £5 at odds of 6/1 on EITHER Anthony Joshua or Wladimir Klitschko winning Saturday's World Heavyweight title fight, plus your money back if it's a draw! Anthony Joshua v Wladimir Klitschko takes place at 22:00 at Wembley Stadium on Saturday April 29 and Ladbrokes are offering new customers the chance to bet £5 at odds of 6/1 on EITHER Anthony Joshua or Wladimir Klitschko winning Saturday's World Heavyweight title fight, plus your money back if it's a draw! 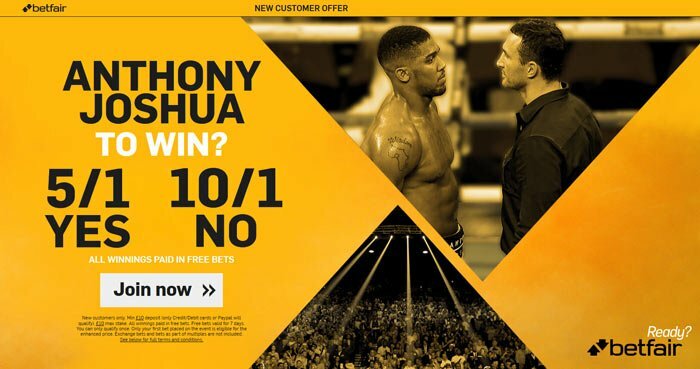 The best price on Anthony Joshua to win the fight is at William Hill! Claim a crazy 6/1 boost on AJ to beat Klitschko! Max bet €/£10! Wladimir Klitschko and Anthony Joshua collide in the most anticipated heavyweight fight of the year on Saturday night and bookmaker Betfair are offering the highest odds on the match! 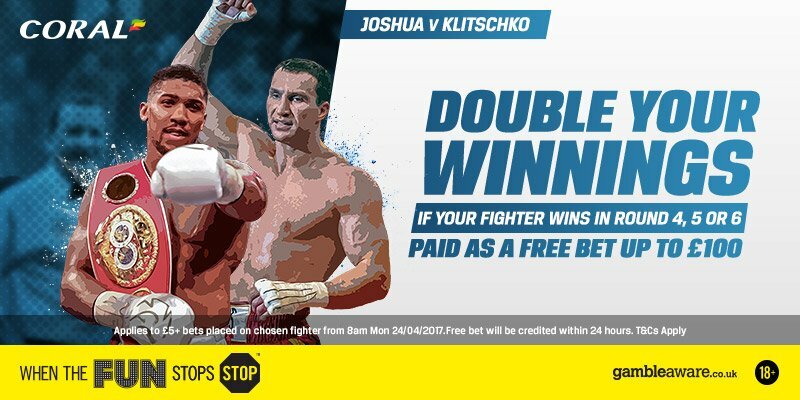 Join via our links and claim 5/1 Anthony Joshua or 10/1 Wladimir Klitschko to win the bout, plus £100 free bets for new Betfair customers! Anthony Joshua and Wladimir Klitschko square off in front of 90,000 fans at Wembley Stadium and Coral are offering 25/1 Anthony Joshua to win the fight (was 2/5), plus £5 free bet if he doesn't! 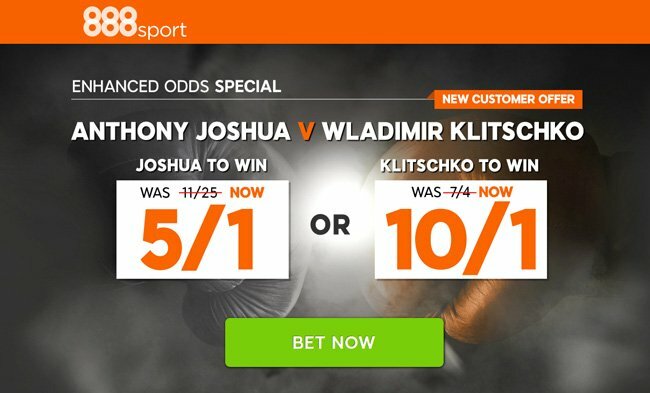 Paddy Power are offering 14/1 Wladimir Klitschko to upset Anthony Joshua on Saturday night! Max bet €/£10! Paddy Power are offering 5/1 Anthony Joshua to beat Wladimir Klitschko on Saturday night! Max bet €/£10! BET £10 ON JOSHUA, WIN £50! Stake £10 on Joshua to win and get paid at 5/1 with BetOnBrazil! Double boost at 888sport! Claim 5/1 Anthony Joshua to win or 10/1 Wladimir Klitschko to beat the British boxer! 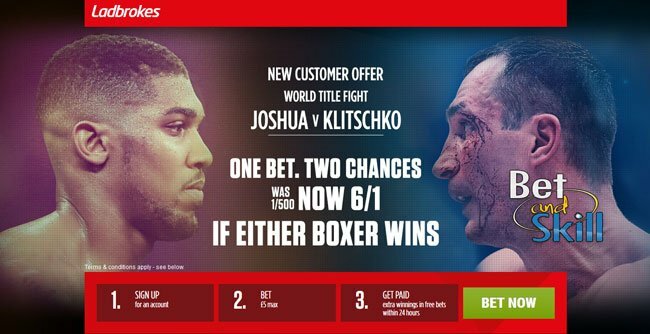 Ladbrokes offer MONEY BACK as a free bet on selected markets if the Joshua v Klitschko fight goes the distance. Get a 600% bonus at Betfred! Stake £10 on the fight and receive £60 in free bets & Casino bonuses! Coral will double your winnings as a free bet up to £100 if your fighter wins in Rounds 4, 5 or 6! "All the Joshua v Klitschko betting promotions, free bets and no deposit bonuses"